Proofreading services by native editors with full careers in English development. We're highly educated in it (master-level or above), and we have years of experience of it. We recruit to very strict guidelines to guarantee a deep and rich understanding of the English language at a linguistic level. Most of our competitors recruit subject-specialist editors with a career-focus in their field, which is not English usage. 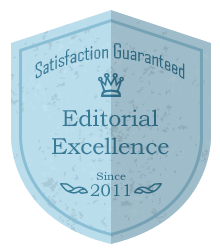 Our editors are required to have a master-level education in an English related subject and experience as an English tutor at a top university. They must also use English as their first language. "Reliable, fast, efficient, and high quality." We'll read through your entire document several times to find spelling, grammar, syntax and word processor errors. The aim is to return your document 100% free of those errors every time. All of our changes are recorded, so you can choose to accept or decline them. Our editors will always ask questions if they need to understand something in more depth. Stylistic issues, such as formatting, style guide rules and awkward language, can be addressed by adding the editing option. Editing enables your editor to suggest a more natural rewording of sentences to provide a much clearer message to your readers, as well as a new set of eyes to check style details. You can submit a style guide with your order.